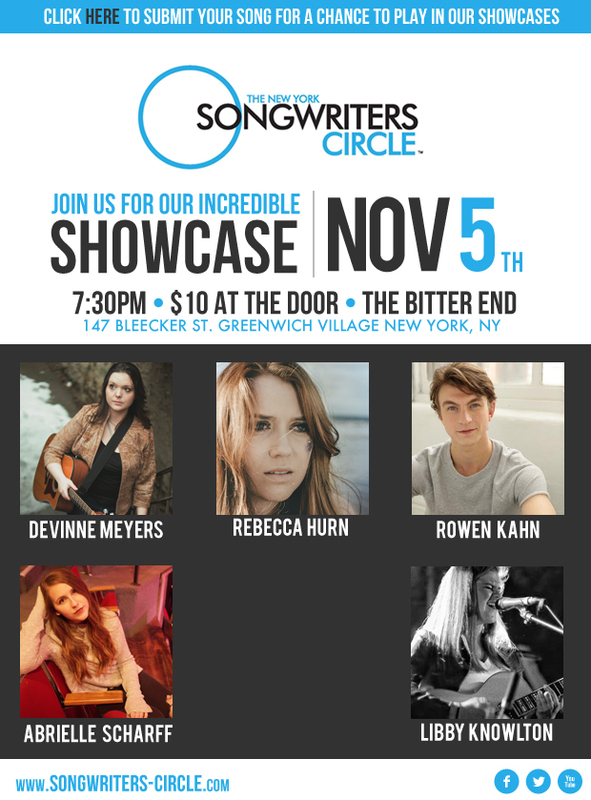 Join us Monday, November 5th for our award-winning songwriter series! Rowen Kahn is a singer/songwriter from Vancouver, BC. He released his first album, ‘Shortcut’, last May and you can find it wherever you get your music. Rebecca Hurn is an award-winning folk-pop singer-songwriter from South Wales, UK. At such an early start to her career, Rebecca has already reached international success with her music propelling her to showcase in major cities such as London and New York. After the release of her most recent Top 50 EP ‘Waves’, Rebecca was named as ‘Best Solo Act’ at the Cardiff Music Awards where she also won ‘Best Single’ for Top 40 hit ‘Lifeline’ in 2017. Rebecca’s voice has been described as a ‘national treasure’ (BBC Wales) and holds thought-provoking lyrics with beguiling melodies. Based out of New York City, Libby Knowlton is an indie singer/songwriter. At a young age, Libby discovered her passion for creating music and has since been consistently writing and performing. Taking to Soundcloud in 2015, Libby has quickly gained a following of loyal listeners with her covers and original material that she is constantly releasing on the website. From Binghamton, New York, comes a sound rooted in passion and honesty, targeted by emotionally direct lyrics, and delivered through a soulful voice and acoustic guitar. Singer-songwriter Devinne Meyers’ upcoming album, ‘Silver Line’ sheds light on stereotypical, stigmatic, and human topics that tend to be swept under the rug or go unnoticed by the status quo. The underlying theme is Pain, and by unveiling the darkness, the goal is to bring healing, awareness, and connection to those who feel alone in their personal journeys. For more information, visit www.devinnemeyers.com, or follow the handle @devinnesmusic on Facebook, Twitter, and Instagram.